"I volunteered to fight, not park my a-- in Ireland." 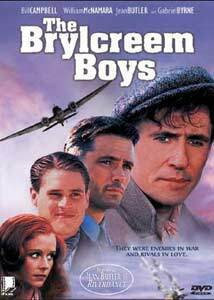 The Brylcreem Boys is a 1997 World War II movie about a group of American, British and German soldiers and pilots interned in a comfortable POW camp after being shot down or otherwise stranded in neutral Ireland. Sentenced to wait out the war under the even-handed eye of camp commander O'Brien (Gabriel Byrne), the "prisoners" lead relatively comfortable lives, with day-pass leaves and other freedoms. When American pilot Miles Keogh (Bill Campbell) is shot down and interned, he makes friends with his flippant young bunkmate Sam Gunn (William McNamara), falls in love with independent local girl Mattie (Jean Butler), and gains a grudging respect for German pilot Count Rudolph von Stegenbek, the ace who shot him down before crash-landing in Ireland himself. Chafing at his inability to participate in the ongoing conflict, Keogh enlists his friend Richard Lewis (John Gordon Sinclair) to engineer an escape, freeing all of the Allied soldiers as well as his honorable enemy von Stegenbek. This is a low-budget, dialogue-oriented film, with few special effects or combat scenes, but it's attractively lit and the period sets, costumes, and Brylcreem-ed hairstyles are convincing if not completely accurate. Director Terence Ryan has a good sense of humor and pacing, and he elicits solid performances from his able cast—each character is given enough screen time to develop, and their relationships are credible (though the trailer and DVD packaging play up a "romantic triangle" that is really not central to the film.) The politics of the situation aren't stated in black-and-white terms, although the Nazis are generally portrayed as the less honorable force, and the characters are allowed to be flexible, selfish and practical in their own beliefs and actions. Ryan's directorial style is neither flashy nor innovative, and the climactic escape sequence has a few editing problems, but the film successfully builds an intimate, front-line impression of the war by exploring a few lives affected by it. Unlike most war movies, The Brylcreem Boys isn't about a major battle, critical mission or even the war itself. It's about human beings at a particular time in a particular situation, and its drama derives from change and growth in the characters' attitudes and feelings. If the movie has a major flaw, it's that not much really happens and the characters' impact on the war is ultimately insignificant—but that in a way is also its main point. Audio Transfer Review: The Brylcreem Boys is presented with monophonic sound, encoded as 2-channel Dolby Digital to play through the center speaker. Bass is somewhat weak on the few occasions it's invoked, and dialogue is sometimes muddy and imperfectly balanced with music and sound. Low-level hiss is present in most dialogue scenes and spills audibly into the subwoofer range during outdoor sequences. The DVD digitization is probably accurate enough, but the analog source isn't everything it could be. Lists of films and notable awards (but no biographical information) for director Terence Ryan and cast members Bill Campbell, Gabriel Byrne and Jean Butler. The film's 1.33:1 full-frame trailer is presented, with heavy hiss in the audio and a soft, muted image. In addition to Film and Cast credits (reformatted text screens drawn from the film's credit roll), a DVD Production page credits the producers and menu designer. The Brylcreem Boys is an interesting, well-written movie about a handful of World War II soldiers from both sides in unusual circumstances. Fox Lorber's below-average DVD release is no standard-setter, but the film itself deserves a look. A worthwhile rental.